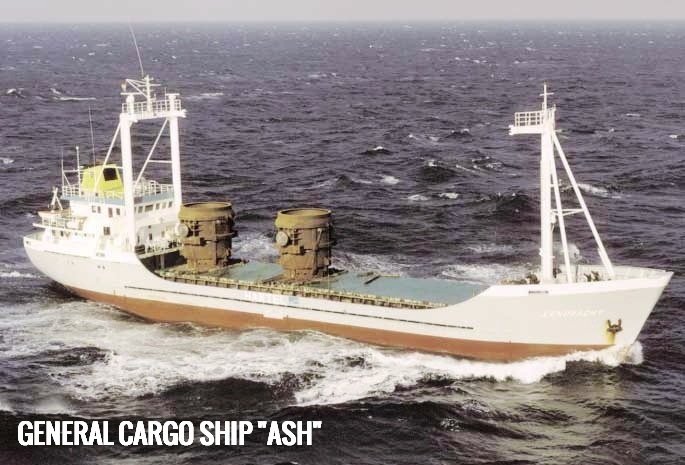 On 9 October 2001, the 1009 gt general cargo ship Ash was en route from Odense, Denmark, to the Spanish port of Pasajes, with a cargo of steel coils. She had six crew on board and was making a speed of about 6.25 knots over the ground in the south-west traffic lane of the Dover Strait TSS to the south-east of Hastings. The 4,671 gt chemical tanker Dutch Aquamarine was also on passage in the same traffic lane, en route from Antwerp to Swansea. She had a mixed chemical cargo and a crew of 12 on board. She was making about 12.5 knots over the ground. Despite the fact that the weather was fine and the visibility good the watchkeeper on Dutch Aquamarine did not notice Ash in the period immediately before the collision until she was very close and right ahead. Ash was holed in the collision, she listed quickly to starboard, capsized and sank. The six persons on board jumped into the water and five of them were rescued by Dutch Aquamarine’s fast rescue craft. Dutch Aquamarine had left the berth at Antwerp at 0210 on 9 October. She had a pilot on board for the outbound river passage. The pilot disembarked at Wandelaar at about 0700 and course was set for the first leg of the passage to Swansea. The passage plan had been entered into the vessel’s STN Atlas NACOS IBS before the voyage began. When she had settled on course, the IBS’s track control system was switched on. The master handed over the con to the chief officer but remained in the wheelhouse to send telexes and do paperwork. At 1200, the chief officer handed the watch over to the second officer. The master left the bridge soon afterwards to go to lunch. The master returned to the bridge to carry on with his paperwork at 1345, as the vessel was approaching the Varne. There were a number of other vessels with the same or a similar route through the Strait. Dutch Aquamarine was faster than many of them and, therefore, was overtaking frequently. The master went below to his cabin to rest just before 1500. Ash had left Odense, Denmark, at about 0000 on 4 October for a voyage to Pasajes in Spain, with a cargo of 1200 tonnes of steel coils. She had made an average speed of about 7.5 knots in bad weather, and had anchored in Margate Roads at about 1700 on 7 October to resecure her cargo. She resumed passage, and entered the Dover Strait TSS at about 0800 on 9 October. The master had kept the bridge watch between 0600 and 1200, at which time he handed over to the chief officer. The master went below at 1215 to have a meal and then rest. At 1400 Ash’s chief officer made a planned alteration of course to 235° using the autopilot. The vessel maintained a steady course over the next 2 to 3 hours (to the time of the collision) at a speed of about 6.5 knots over the ground. She was overtaken by a number of vessels during this time, including one at a distance of about 0.1 mile on her port side. A cadet was on Dutch Aquamarine’s bridge, in addition to the second officer. He was making entries in the planned maintenance log and had no part to play in the navigation of the vessel. The watch alarm was turned off. Immediately before, and at the time of the accident, the cadet was standing behind the chart table and did not notice Dutch Aquamarine closing on Ash. Ash’s chief officer had seen Dutch Aquamarine approaching through an aft facing window by the chart table. He noted that she had been about 1 mile away when he went to the centre of the bridge to answer a telephone call. The call had been from the vessel’s charterer. The chief officer was still talking on the telephone when he heard shouting from one of the crew on deck. 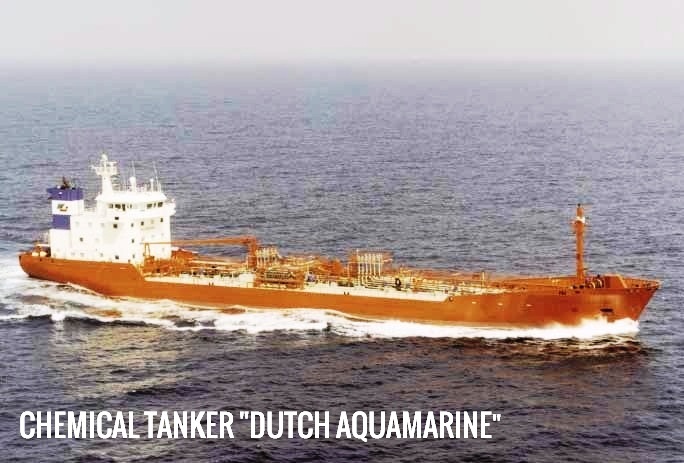 Dutch Aquamarine’s second officer did not notice Ash in the period immediately prior to the collision until she was very close and right ahead. At about the time that Dutch Aquamarine struck the starboard quarter of Ash, the second officer put Dutch Aquamarine’s helm hard to starboard and the engines full astern. The collision occurred at 1620 and after the initial impact Dutch Aquamarine scraped up Ash’s starboard side. Tha following image is an extract from CNIS plot showing the tracks of Dutch Aquamarine coincident with that of Ash. Marks at 6 minute intervals. The shouting on Ash had been followed soon afterwards by a crunching sound. Ash swung quickly to starboard and initially heeled to port. The master arrived on the bridge and asked what had happened. At that time the chief officer did not know. The chief officer saw the bow and red hull of Dutch Aquamarine right on the starboard beam. The master ran to the VHF radio to transmit a distress message, and the chief officer put the helm to port to try to stop the swing. There was a second contact and Dutch Aquamarine became wedged in Ash’s side just forward of her superstructure. Dutch Aquamarine remained wedged for only a short time before her astern engine movement took effect. She moved astern and clear of Ash. Ash was listing to starboard as water was entering her cargo hold. Ash’s crew had congregated on the bridge. They were all wearing lifejackets (two had been stowed in the wheelhouse). The master ordered them to “jump”. The chief officer went quickly to his cabin and then returned to the bridge. The vessel had developed a severe starboard list. The three ratings had jumped into the water and the master had slipped from the bridge wing and fallen on to the open deck below. With some difficulty the chief officer helped the master to the side from where they both jumped into the water. The chief engineer,meanwhile, had also jumped into the water. The chief officer’s lifejacket had not been secured properly. It came off when he entered the water but he was able to grab and hold on to it. He saw the master in the water with his lifejacket floating some 20m away from him. He noted that the master was trying to hold on to one of the steel hollow-section hatch covers. Ash capsized and sank by the bow. She remained vertical with her stern out of the water for some minutes before she finally disappeared beneath the surface. The three ratings were quickly rescued from the water by Dutch Aquamarine’s rescue boat, manned by her chief officer and cadet. The boat was unable to safely carry more than five persons in the moderate sea conditions, and first took them to Dutch Aquamarine before returning for the others. Dutch Aquamarine’s chief engineer who, using a pair of binoculars, was looking out for survivors, was, through the master, directing the crew of the boat. In this manner, they were able to locate the chief officer and chief engineer, who were recovered from the water. They could not see Ash’s master. They searched for some minutes, but Ash’s officers were beginning to suffer from the cold. The surviving officers were embarked on to Dutch Aquamarine and the rescue boat returned to continue searching for the master. The crew searched among the floating equipment, which included the hatchcovers and, by this time, an inflated liferaft but did not see him. The boat was returning slowly to Dutch Aquamarine when, finally, the crew saw the master floating face down in the water. They tried to pull his unconscious body on board the boat but found it impossible. A coastguard rescue helicopter had been alerted and was close to their position, so the crew turned him over and held him until it arrived. At about 1705, the master was lifted into the helicopter and taken to Hastings Hospital. Despite attempts to resuscitate him on the aircraft and ashore he was later pronounced dead. Ash was right ahead, or nearly right ahead, of Dutch Aquamarine for over an hour before the collision. 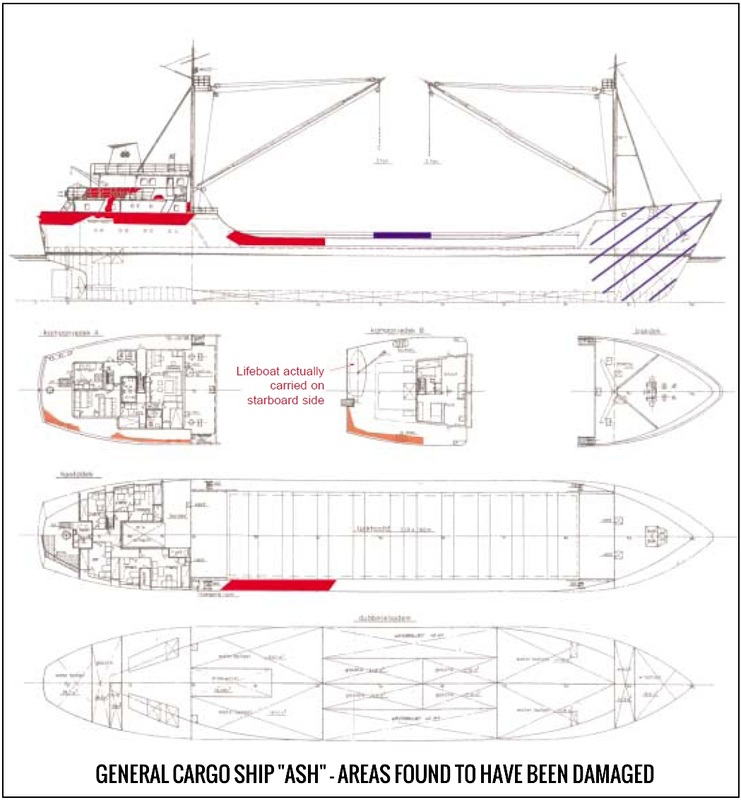 It is concluded that the second officer on Dutch Aquamarine did not notice Ash, either visually or by radar until collision was imminent and that, therefore, he was not keeping a proper lookout. The watchkeeper on Ash saw Dutch Aquamarine approaching, but was distracted from lookout duties in the minutes before the collision by a mobile telephone call. He was therefore unaware of the developing situation and unable to fulfil his obligations as the stand-on vessel under the Collision Regulations. The MAIB believes that in heavy traffic situations like those that exist in the Dover Strait TSS, the posting of a dedicated lookout is a sensible and seamanlike precaution. Had such a lookout been posted, it is likely that the collision would have been avoided. The large majority of vessels transiting the Dover Strait in the south-west traffic lane choose tracks which run parallel and close to the northern edge of the lane. This causes bunching of traffic in this area. It is possible that many navigators might not be fully adept in the use of GPS and track control systems, and this causes them to return to the programmed track after anti-collision manoeuvres. This, in turn, tends to maintain the bunching of traffic on the popular pre-programmed tracks. In the past, when deviation from the charted course was necessary for anti-collision purposes, it was common practice to parallel the required track until the next alter course position was reached. Dangerously close overtaking has become commonplace in the south-west lane of the Dover Strait TSS. 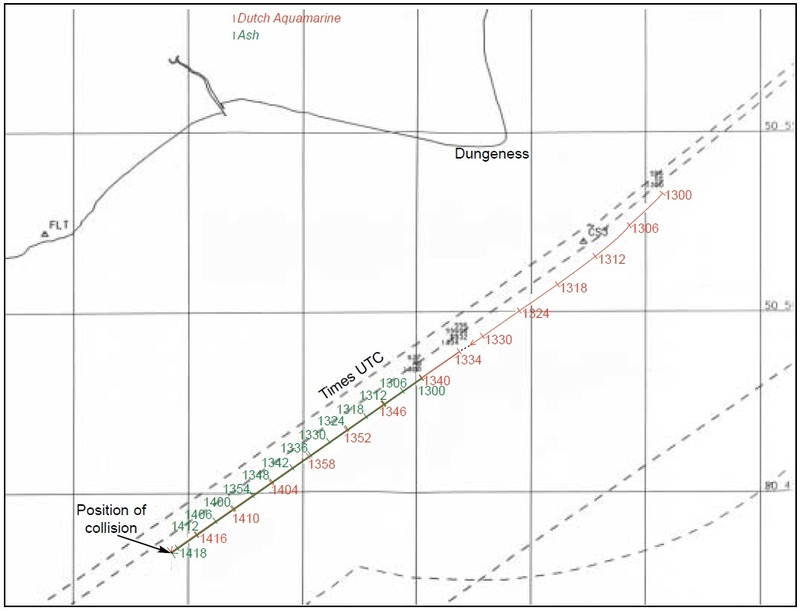 The recent history of collisions in the south-west lane indicates that dangerous situations arise where vessels of markedly different speeds are travelling on coincident tracks. There was an intermittent fault within Dutch Aquamarine’s IBS which made the ARPA facility of both her radars unreliable. The ARPA facility is used in assessing risk of collision and planning anti-collision manoeuvres. However, the identification and manual acquisition of the target is a prerequisite for the use of this facility. The able seamen on Ash never undertook bridge watchkeeping duties. This was in contravention of STCW 95. There should be careful consideration on whether passage planning strategy is adding to congestion in the Dover TSS. Consideration on whether the way electronic navigation aids are used on their vessels could be reducing the flexibility of watchkeepers to use the whole traffic lane in areas of congestion. Use of the full width of the traffic lanes to reduce collision risks.